Born and raised for 25 years. One of my favorite sandboxes to play in. So I went with this one. Its of the Sandia mountains Sandía means watermelon in spanish, and is popularly believed to be a reference to the reddish color of the mountains at sunset. 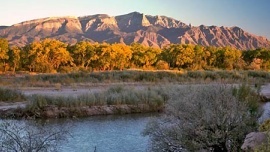 Also, when viewed from the west, the profile of the mountains is a long ridge, with a thin zone of green conifers near the top, suggesting the "rind" of the watermelon which is the backdrop of albuquerque. So my final I will use the colors of watermelon to help bring it to life.